After a challenging, but well handled delivery, Glen, his crew and Georgiana are all safely home. The North Sea can be a hostile place in winter but this didn’t put them off. They dealt with everything with a certain pluck and tenacity that her owner really appreciated. “Micky and I met up in Kirkcudbright and got a lift to Dumfries where we got the train for Edinburgh. In Edinburgh we were joined by Chris and changed trains for Inverness. 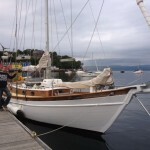 Keith had travelled up from Bristol the evening before and met us at Inverness station along with Martin, the owner of Georgiana K.
Martin took us to the marina and introduced us to Georgiana K, a 40’ Atkin designed wooden cutter, double-ended and tiller steered. 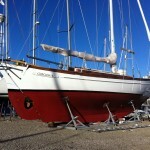 She was an eye-catchingly beautiful boat but was in need of some maintenance, which we did our best to provide. Picking up the hired liferaft, which had been delivered to the marina office, we got aboard and started to get settled in. With Martin’s help we spent what remained of the Saturday going over the boat thoroughly to find out where everything was and to list what we would need to do and to buy for the delivery voyage. That evening Martin’s parents invited us to their home for a very pleasant dinner. On the Sunday we made an early start on the jobs and Martin very kindly drove us around to do the victual and spares shopping before he had to leave to catch a flight to Amsterdam. By early evening we were ready to sail and decided on an early night and an early start on the Monday morning. It blew pretty hard through the night but the forecast was for the wind to settle into the south then west and to calm down. The passage through the Inverness and Beauly Firths was uneventful and gave us a chance to get the feel of Georgiana in calm water. The wind was fairly easy as we ran along the Morayshire coast then began to freshen from the SSE as we passed Fraserburgh and started to head south. Coming over the land it gave us a bit of a lee for a while until the coast started to tend southeastwards. Then the sea started to get pretty lumpy. By the time we were off Peterhead we were bashing into fairly substantial waves so we looked into the marina in Peterhead for a few hours till it began to settle a little. 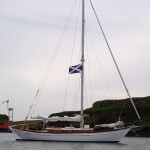 The sea state improved steadily as we headed towards Fife intending to keep close to the shore for the lee but the wind started to head us so we bore away onto a course directly for Eyemouth. As we approached Eyemouth the engine started to hunt around and stagger a bit then it cut out completely. Checking it over and trying various solutions it became clear that the primary filter was blocked, probably with sludge from the fuel tanks – and we didn’t have a spare. Micky, who has a lot of experience working with diesels, niftily bypassed the filter with a biro and got the engine going again, which was just as well as our attempts to beat in towards Eyemouth against a short, steep sea weren’t having a lot of success. In Eyemouth we topped up the fuel tanks and tried to get spare cartridges for the primary fuel filter that had caused us the trouble as well as a number of other bits and pieces we needed to do small running repairs. We were able to get cartridges for the secondary fuel filter but not for the primary, which was quite an unusual model, so we bought a couple of lengths of copper fuel pipe and made the temporary repair sufficiently secure to allow us to complete the delivery. Waiting for the spares meant staying overnight so we had a meal ashore and got an early night. The following morning the wind was still fairly brisk but was backing more into the west with the forecast that it would go north of west as the day went on. We made a fairly splashy exit from Eyemouth and set course for the Farne Islands. We made a fast passage to the Farnes with a stiff WNW breeze which got so brisk that we reduced sail to just the staysail off the Longstone Light and ran on down the coast to Scarborough. We had to wait for a while off the entrance to Scarborough harbour for enough water to get in but it was a good opportunity to top off the fuel tanks again (mainly to reduce the amount of sloshing about the diesel was doing to try to limit the amount of silt that was being lifted off the bottom of the tanks). We also were able to repair the Lavac loo which had not been working properly and to pick up some odd bits of provisions. We were only in Scarborough for a couple of hours but we left feeling that we were in good shape for crossing the North Sea from Flamborough Head to IJMuiden. The crossing was uneventful with a decreasing wind and an easing sea. We motorsailed the whole way to keep the speed up and made very good time, arriving in the marina at IJMuiden around 2100 on the night of Saturday 16 November. The passage had taken five and a half days overall which, with our stopovers, meant that we’d been around four days at sea. Martin came over from Amsterdam with some beers and we celebrated our safe arrival before turning in for a good sleep. Martin came over again the following morning and we motored Georgiana up the canal to the mooring in Amsterdam where she was going to stay for the winter to get work done on her.